Cocoia Blog » Make more from your Leopard movie collection. 06 Jan Make more from your Leopard movie collection. 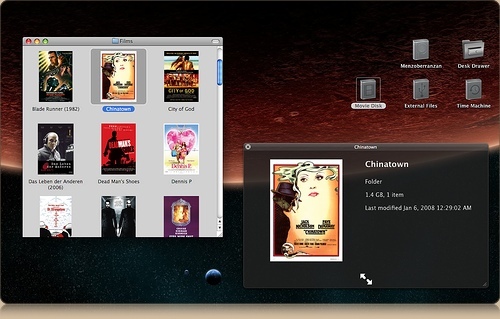 Whether you have purchased movies online, made digital backups, or simply have movies stored on your Mac or on an external drive, it tends to turn into a rather dull folder tree with a list of movie titles. 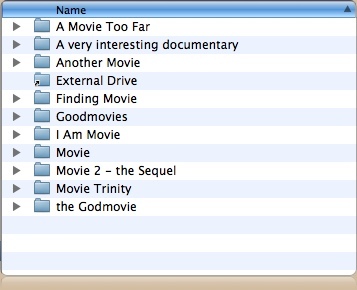 Quick look or Cover Flow won’t help me out – I put my movies in directories. Ouch, this isn’t exactly visual browsing. Since I had this problem with my digitalized movie collection and I wanted to browse them casually, while at parties and with friends on my Macbook Pro, or simply at home on a dull afternoon, I figured something out to make everything a lot more appealing. Dive on in. You need very little tools, and a bit of effort for this improvement in your movie-browsing user experience. First of all, get img2icns – it’s a neat freeware, open-source app that will turn images you drag onto its icon into an ICNS file, a folder icon (which is what we want) or something else, which isn’t needed in this how-to. Get it here. Nice! Click for larger on Flickr. And that’s all there’s to it to beautify your collection. Try it in Cover Flow – img2icns supports icons up to 512×512 pixels, so using large images will result in some very nice images! Or wait for Delicious Library 2. Any. Day. Now? Nope. Why not just paste the image straight into the icon in the “Get Info” window? I tried img2icns and it looks like it has the same result, visually anyway. Have you solution to do the same thing in frontrow ? Something that may not be as visually attractive but still works is to make a smart search based on the file extensions of the movies, and set that folder to open in Cover Flow mode. Is there a site where we can find good resolution poster images? Especially for older show? R-max; I will look into a solution for Front Row. So far, I transcode my movies to MP4 and add them in iTunes with Cover art to see them in Front Row and on iPhone. Alex; try google images in general, but specifically, the internet movie database poster awards gallery often offers high-res posters. Thanks for the tips and comments, everyone! Love the desktop background! Where did you get it? Great article by the way. Not sure if you’ll read this, Leonardo, but the desktop background’s linked on flickr (just click the desktop image in this post to go to the flickr page for it). Thanks! I’ve tried the copy&paste/get info route and the quality just isn’t good enough – img2icns works really well, thks sebastiaan!